Give your shoes the proper polish with our black satin spats! Our spats are the genuine article, with real fabric buttons, durable cotton lining, and fine black satin body. Our four-button men's spatterdashes will turn any perambulation into a tickertape parade. Features a subtle black elastic stirrup to maintain a tidy look, and offered in several sizes to ensure an excellent fit. Imported. Body is a satin-finish polyester fabric, lining is all cotton. Dry cleaning recommended. This price is for a pair of spats only. Shoes not included. See our whole line of mens spats here. To measure for spats, measure your ankle circumference as shown, just above the ankle bone. 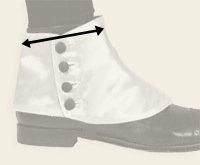 If you plan to wear the spats over ankle boots, be sure to measure with the boots on. Can we bring these back? First pair of spats I have ever owned. I would love to see these come back into style! So classy and only got them for Halloween! Thank you! My husband loves them. Wears whenever we have a special occasion. Good price..excellent quality...fast delivery... Thank you!! These spats really take your sartorial splendor up a level. Good quality for the price! I wanted a vest and the one I ordered was too large and your clear instructions to order a new one helped it arrive probably quicker than the one I returned to you. Very nice. . I had a look I was going for and am pleased with your product. I ordered this same top hat several years ago but now needed a larger size. The price had increased about $30.00. The Pecan color this time was a couple of shades darker than the first one - but - it's actually the color I really wanted! So this was good. It's just perfect! Just wanted to add a comment for customer service rep - food for thought - the first hat which was less expensive was packaged beautifully, with cardboard supports top and bottom, circling all around the hat and a plastic covering over the hat as well (included in the price). I still use that box to store the hat - because it won't be damaged. That perfect extra touch for such a stylish top hat. This new top hat was just placed in the box with some tissue, not even a plastic covering. Had the box been damaged in shipping, so would the hat have been dented. It cost more now and the packaging was so much less. I know things have gone up, but the "premier" packaging should have been included in the new price increase. It's not really a big deal, but I did miss that personal touch in packaging. 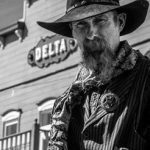 I do however LOVE the hat and Historical Emporium. Great product(s) and would order again and again. Thank you.